Leaders of All Progressives Congress (APC) in Alimosho axis of Lagos State, Saturday, lauded Governor Akinwunmi Ambode over the completion of 21 roads and three bridges connecting the state with Ogun State. 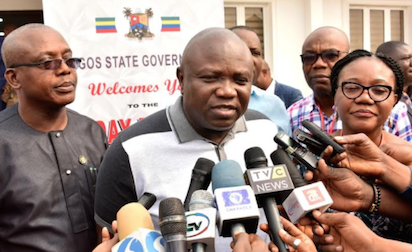 The leaders, in a joint statement, said the development was another testimony to the commitment of the state administration to make every part of Lagos economically viable and livable. They are the senator representing Lagos West, Solomon Adeola Olamilekan; member, House of Representatives representing Alimosho, Olufemi Adebanjo; his counterpart representing Ifako-Ijaiye, Nurudeen Akinwunmi; Lagos State Commissioner for Employment and Wealth Creation, Mrs. Uzamat Akinbile-Yusuf; Special Adviser to Governor Ambode on Housing, Kehinde Joseph; member, Lagos State House of Assembly, Bisi Yusuf; and Lagos State APC Organizing Secretary, Alhaji Abdullahi Enilolobo. “The commissioning of a network of 21 roads, totaling 27km with bridges from Command, Ipaja to the boundary of Ogun State, marks the final implementation of a vision started by our leader, Asiwaju Bola Tinubu with the construction of LASU-Iba Road, to Egbe, Igando and Egbeda (when Ogbeni Rauf Aregbesola was Commissioner for Works)”.